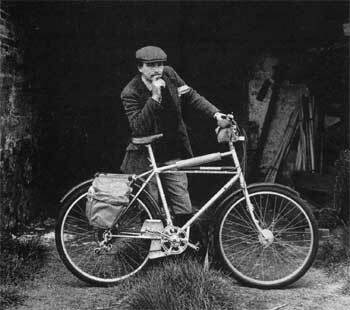 In the early 1970s, Geoff Apps began developing off-road bicycles. If Geoff had been based in the US, he'd doubtless have hooked up with Joe Breeze, Gary Fisher, Charlie Kelly, Tom Ritchey and the rest of the Mountain Bike Mafia. But Geoff was a Brit, and he developed his designs in isolation on the south east coast of England. His bikes are a fascinating byway in the development of two-wheeled transport. In 1962, Geoff's family moved from east London to the foot of the Chiltern Hills. He soon discovered woods riding and began to modify his bicycles appropriately. In time he became an expert motorbike trials rider, but he never lost his love for the simplicity and quiet of cycling. As Geoff's modifications became more ambitious, his trials experience became more important as an influence. It informed the high bottom bracket and upright riding position he favoured, gentle on the wrists and perfect for low-speed balance. In those days Geoff was frequently to be seen riding the muddy, winding forest trails in full tweeds, exuding grace and refinement. Geoff himself said "...you've got to look dignified and relaxed, even when you're riding through twelve inches of crud..."
In 1980, Geoff launched Cleland Cycles and began to produce his designs commercially. 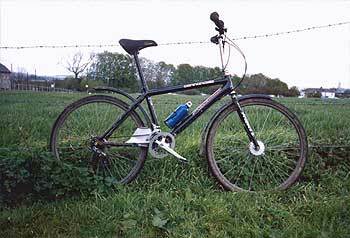 His first model, the Aventura, incorporated a trials-style Duralumin bashplate under the bottom bracket. (This feature, years ahead of its time, would turn up on several other Cleland models.) The 26" adult BMX wheels which powered US MTBs were not available in the UK, so Geoff went with the French 650B rims developed for tandems and expedition tourers. These were paired with heavy-duty Nokia tyres, whose thick sidewalls were well-suited to low-pressure riding. The Aventura also offered drum brakes and full-length mudguards with massive 2" clearance, both designed to enable the bike to cope in the gloopiest English woodland. The Aventura was a remarkable cycle, responsive, sure-footed, and able--in the right hands--to clear almost any trail hazard. Despite this, Geoff struggled to find backers for his planned expansion. Time and again, he was told that offroad cycling had no commercial future. 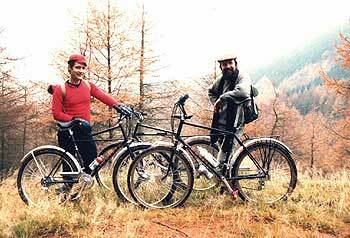 Then, in 1983, mountain bikes arrived in the UK. Overnight, offroad cycling became an industry goldmine, and Geoff became one of the most energetic boosters of the new machines. 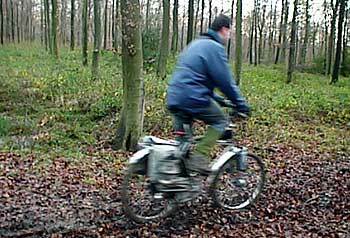 He led rides around the Chiltern Hills and launched the Wendover Bash, a pioneering UK offroad race. He was also one of the founders of 'Making Tracks', a mountain biking fanzine. Ironically, the success of the new arrivals from California ensured that Geoff's own designs never went into full production. However, he continued development in his spare time. A 24 inch wheeled full-trials prototype, called the 'Dingbat' appeared in 1985, followed in 1986 by the 'Clelandale', a stock Cannondale built up with high-rise bars and the Cleland signature drum brakes. These were shown off on the rides he led, winning a small but dedicated circle of admirers. Making Tracks was absorbed into New Cyclist, and Geoff followed the editorial office to the Scottish borders and then back to London. After the magazine folded in 1993, Geoff wrote a well-regarded book on cycle maintenance. Today he lives on a country estate beside the River Tweed, where he is working on his second book, an adventure novel with a cycling hero. He emerges every December for a reunion of Cleland owners and a ride around his old stamping grounds. Many Cleland features have been adopted by other manufacturers, but no one design has yet brought them all together. Given the unique qualities of his bikes, Geoff believes that an updated Aventura could find a niche in today's diversified offroad market. James Walters is a graphic designer based in London. He spends his time away from the computer on the roads and trails of South East England. James runs a site dedicated to Cleland, with many more images.